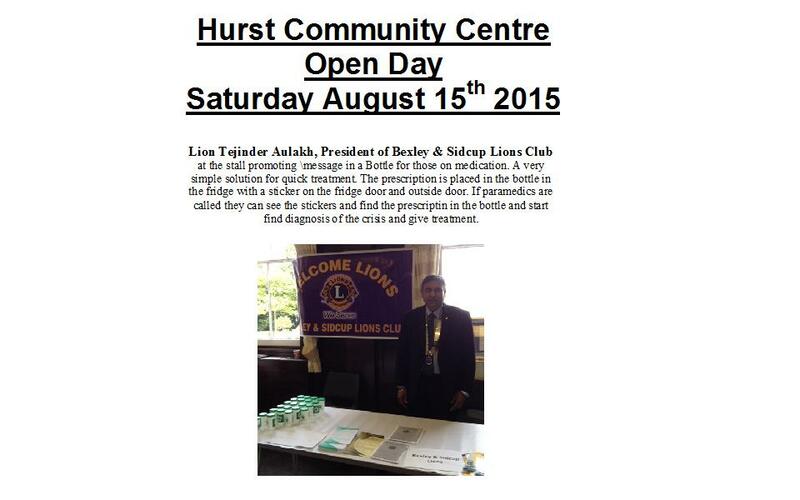 Welcome to our Bexley and Sidcup Lions Club website. We are part of Lions Clubs International- the largest service organisation in the world with membership across 200 countries with 1.4 million members serving. 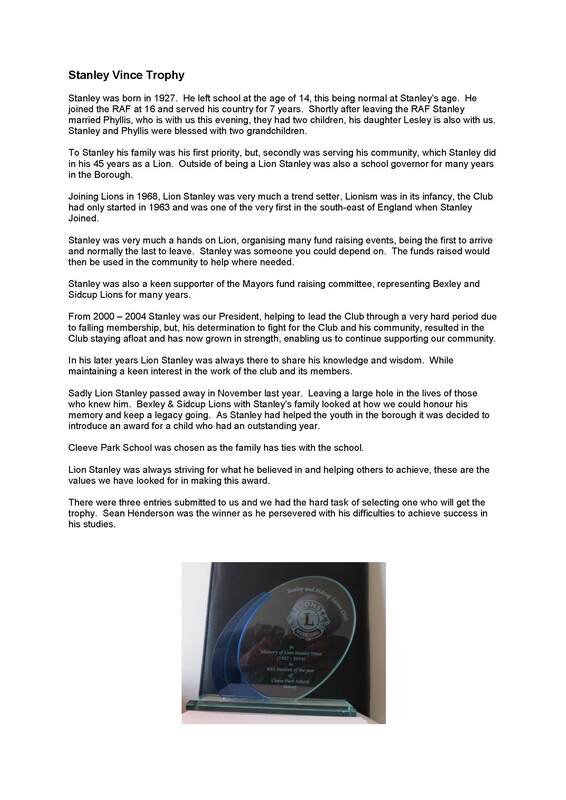 Our club was formed in 1963 and has mixed membership who support the local community and lions charities internationally. 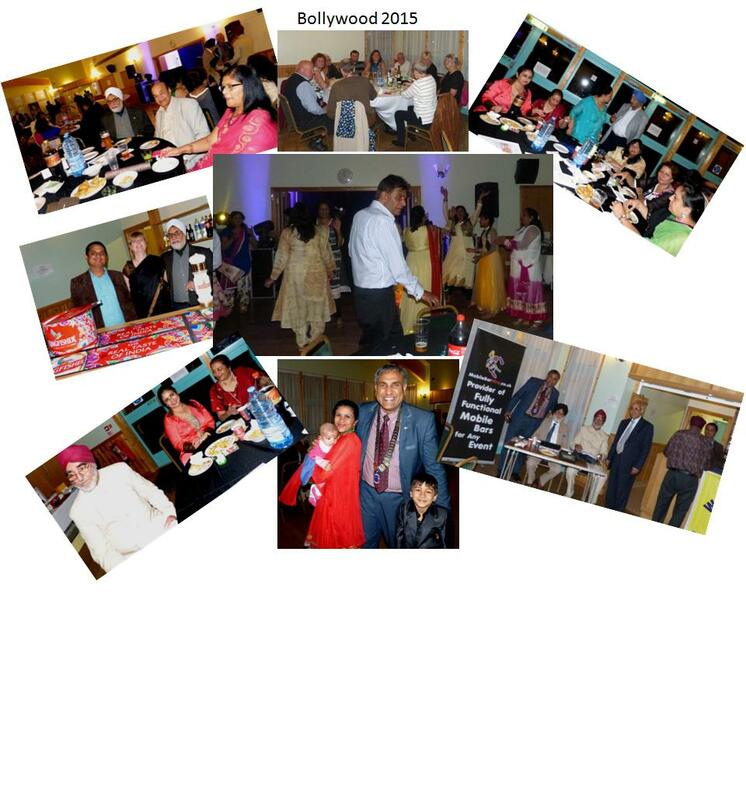 We organise various activities and events throughout the year to raise funds such as Bollywood Nights, sposored walks, Christmas collection, stalls at fairs etc. All money raised are used for charities we support. The administration fund is raised through the subscription paid by members and raffles held during meetings. 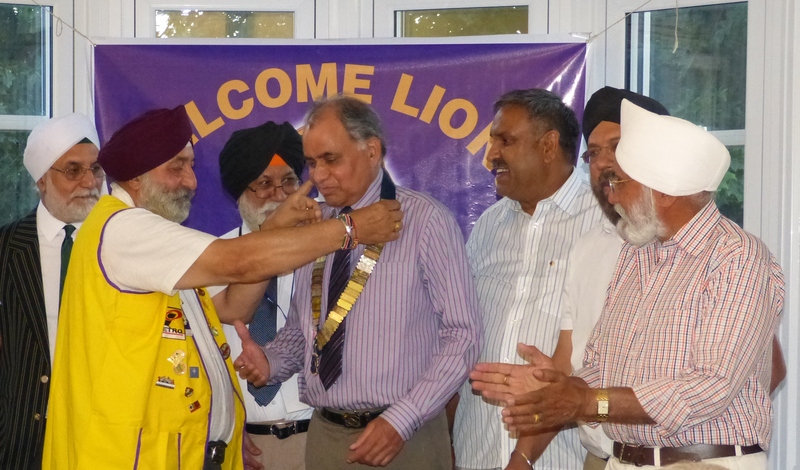 Lion Tejinder Aulak handed over the president's chain to Lion Karamjit. 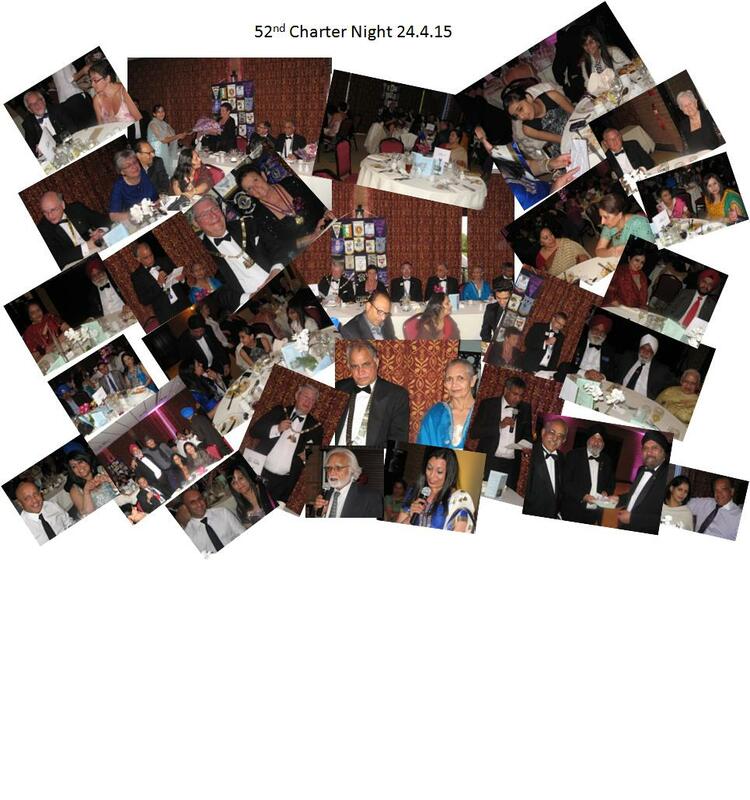 Members and guests enjoyed a delicious meal that evening. 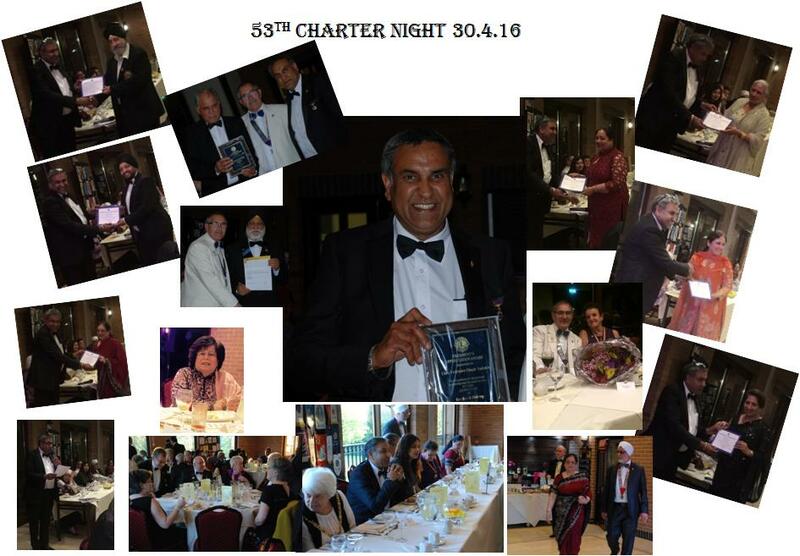 30.4.2016 Charter Night - President Lion Tejinder Aulakh with chief guests DG Lion Bob Prebble and Laion Jacqui Prebble, Mayor of Bexley Cllr Sybil Camsey with Mavis Turvey and Zone Chairman Lion Karamjit with Gudi Matharu and members of the club with their guests. The new year started off well. 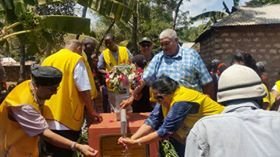 A 3rd water borehole was installed in Kenya. On 31.1.16 the opening ceremony was performed in Kutsuna village, Kenya, East Africa. 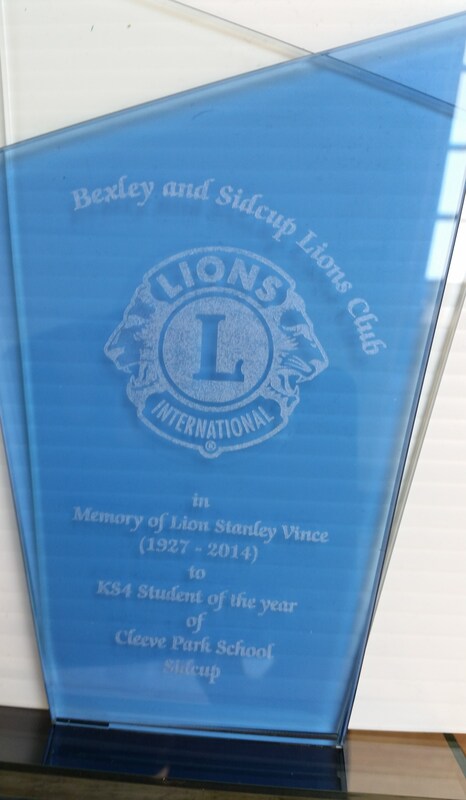 Bexley and Sidcup Lions Club plaque was erected under the name of past president (21015-2015) Lion Gurdial Rai MBE. 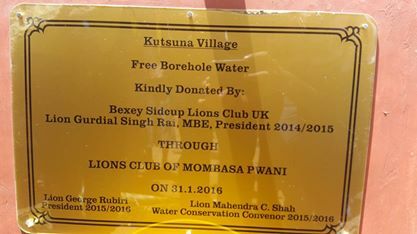 Lion Kalwant Main had taken the intiative for the project and Lions Club of Mombasa Pwani assisted for the completion of the project. Lion Kulwant Selhi hosted the directors meeting. Partners enjoyed socialising. Bucket Collection in Welling High street Members were out there in full force to collect funds for Ellenor Hospice and Lions other Charities. 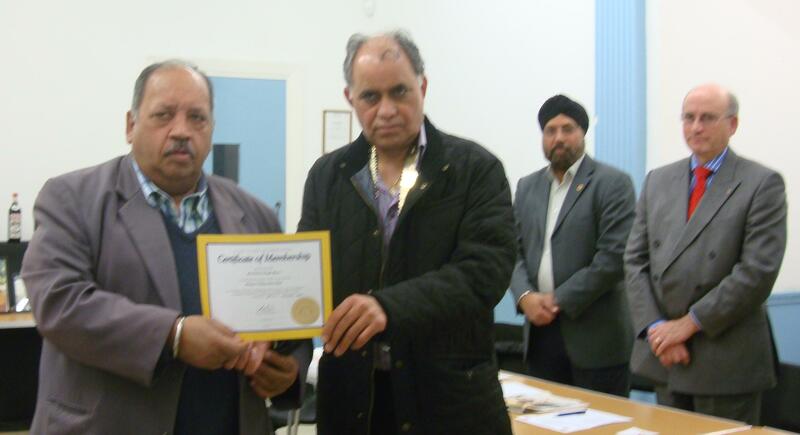 Ramesh Sawhney was inducted as a new member. He has been introduced by Lion Devendra and Sposored by Lion Kulwant Selhi. 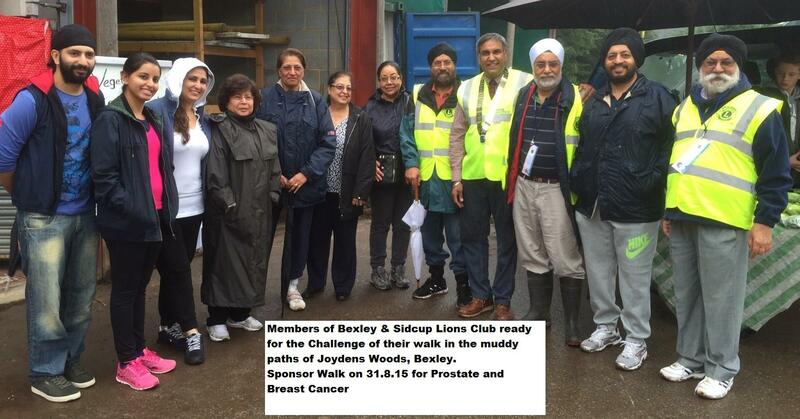 Sponsored walk raised £ 1355, which was divided between two charities, Breast Cancer and Prostate Cancer. Pippa Ward, the co ordinator for both charities received the cheques. It was a great success like previous years. Food was delicious, music was fantastic and plenty to drink. Thanks to Lion Verender for supplying Kingfisher Beer. student from Key Stage 4 &5 Matthew White became seriously ill and had heart transplant before his GCSE exams. Matthew had to catch up and despite these difficulties he managed to achieve outstanding results. 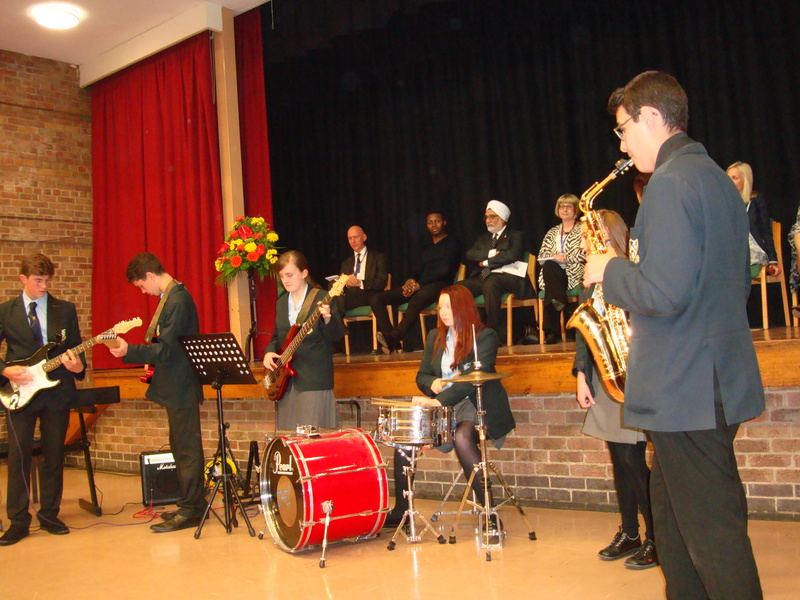 Students from the music class provided the entertainment that evening. Members and their friends braved the weather as there was a downpour of heavy rains and completed the walk. Those who couldnot walk were working at the stall in Mount Mascal Stables selling freshly made Indian Snacks. Gurdial Rai handed over the presidential chain to Lion Tejinder Aulakh on 21.7.15. 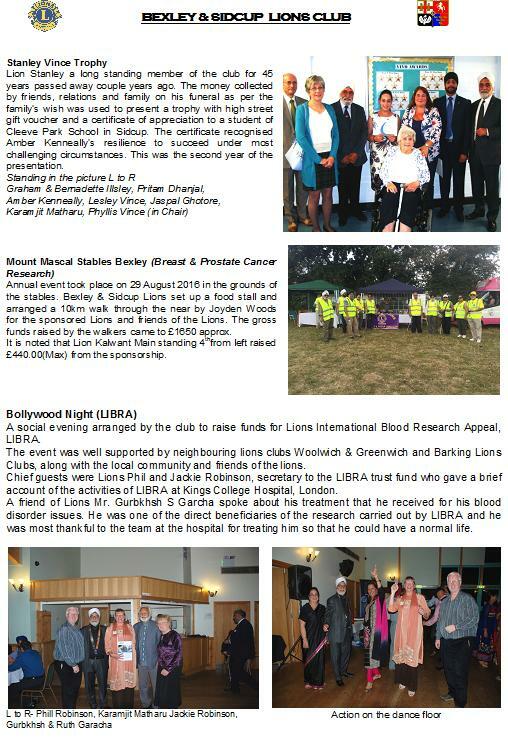 Lion Gurdial was pleased with his successful year, raised funds for various charities and locally and internationally. 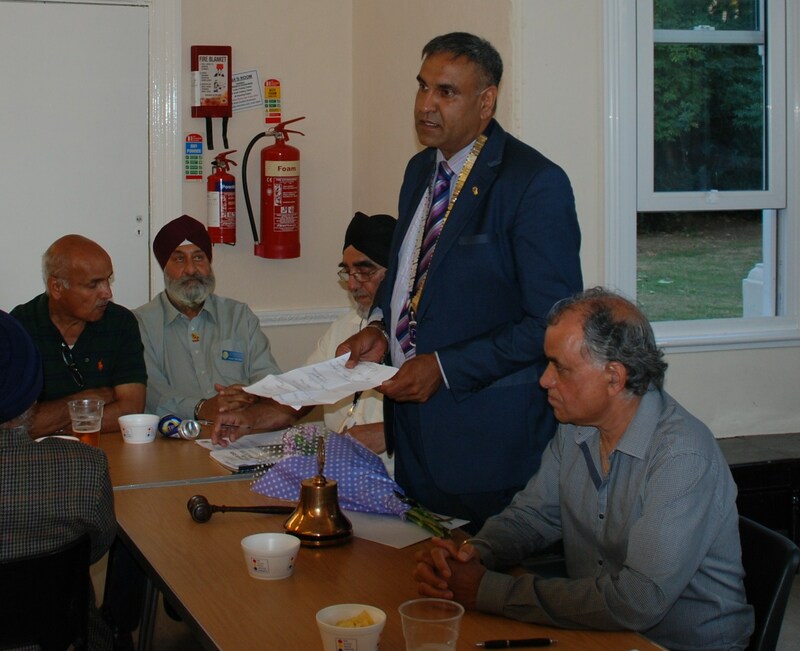 Incoming President Lion Tejinder Aulakh promised to carry on the good work and carry on supporting our charities but his main charity will be Breast Cancer Care. Cheque presentation to Local Lad who is quadraplegic. Andrew Selby. who is paralysed neck downward due to a car accident, needs all the help we can give to make his life a little bit easier than it is now. 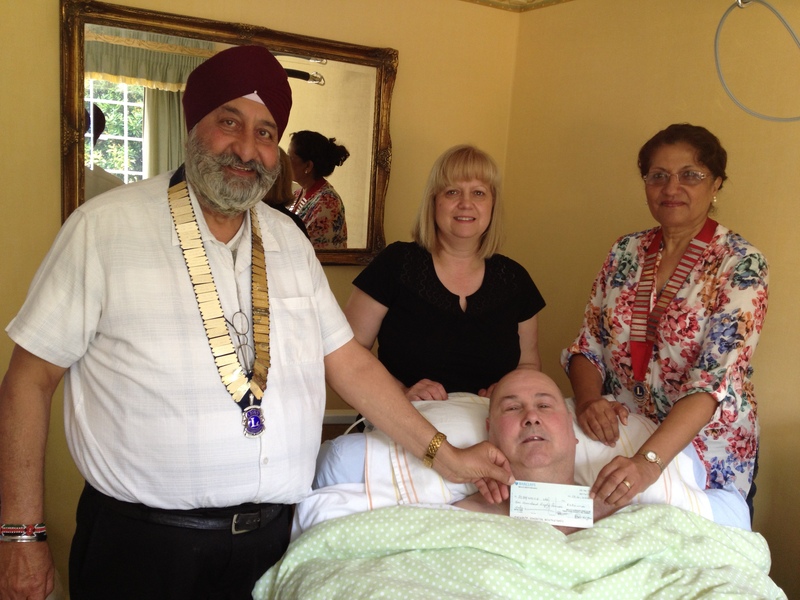 We donated £250 towards a purchase of a Tilt Table to help him strengthen his bones. 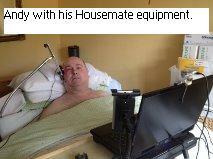 Last year we assisted hime in buying a sophisticated Housemate equipment, which can be used to control entertainment, computers, Lights, phones and etc, giving him some independance. The equipment works on voice recognition and using the head pedal. Andy finds it very useful. 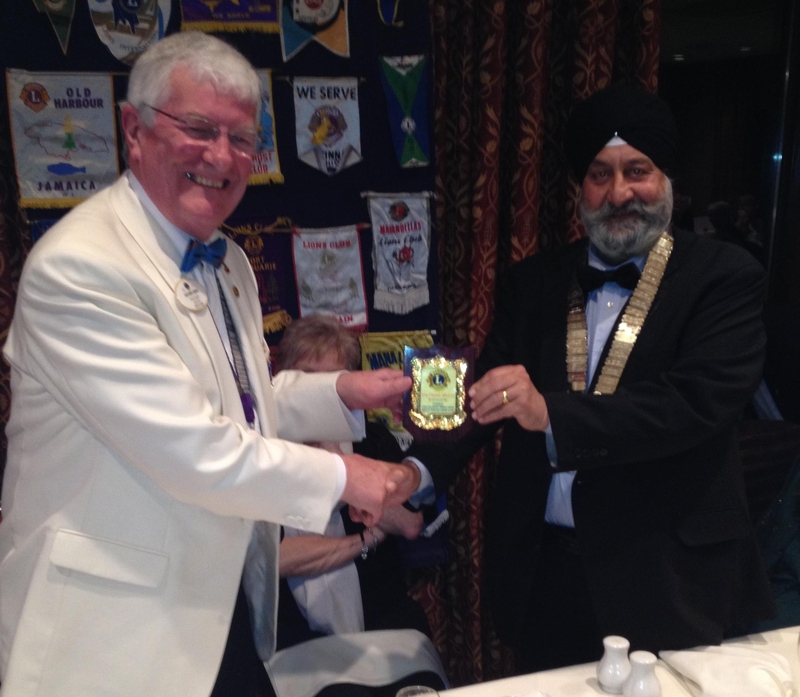 A new member, Mr Kirpal Heer, was inducted on 21.4.15. 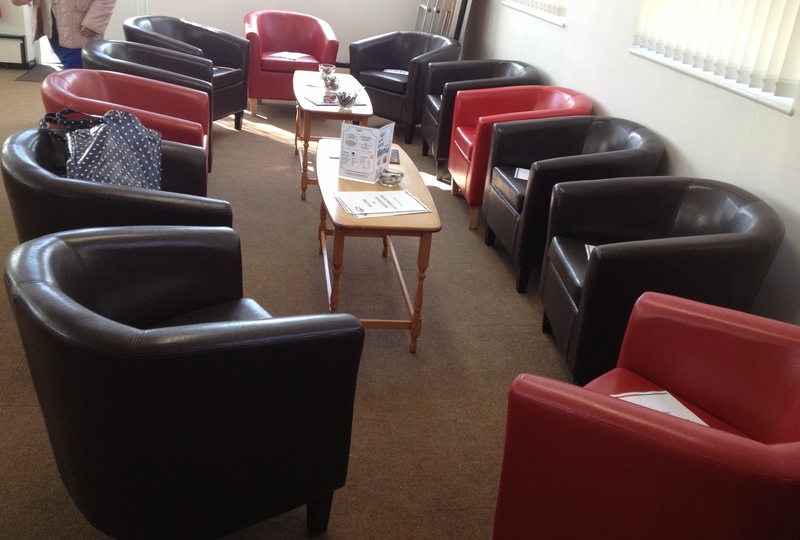 Club donated £600 for new comfy chairs for the newly refurbished parlour in Northumberland Heath. 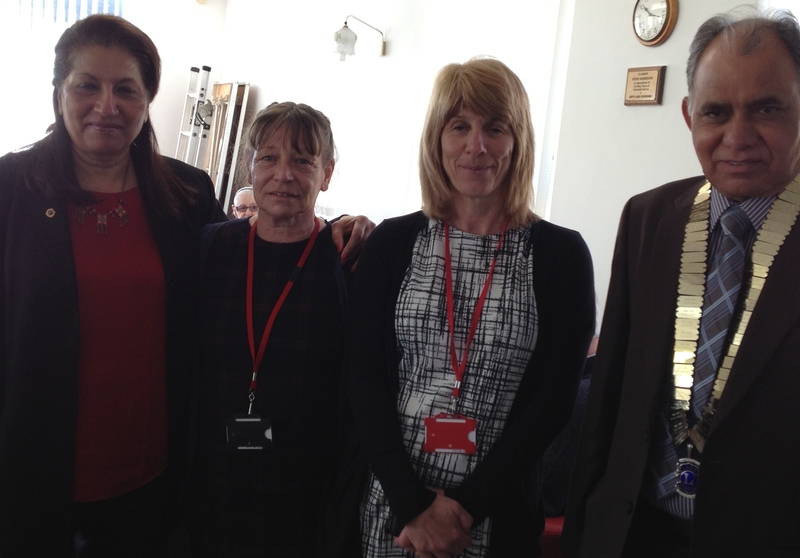 President Lion Gurdial Rai with Lion Kaldip, Della Jeffery( Manager) and Debbie at the opening ceremony on 20.4.14. Tub chairs for comfortable seating. 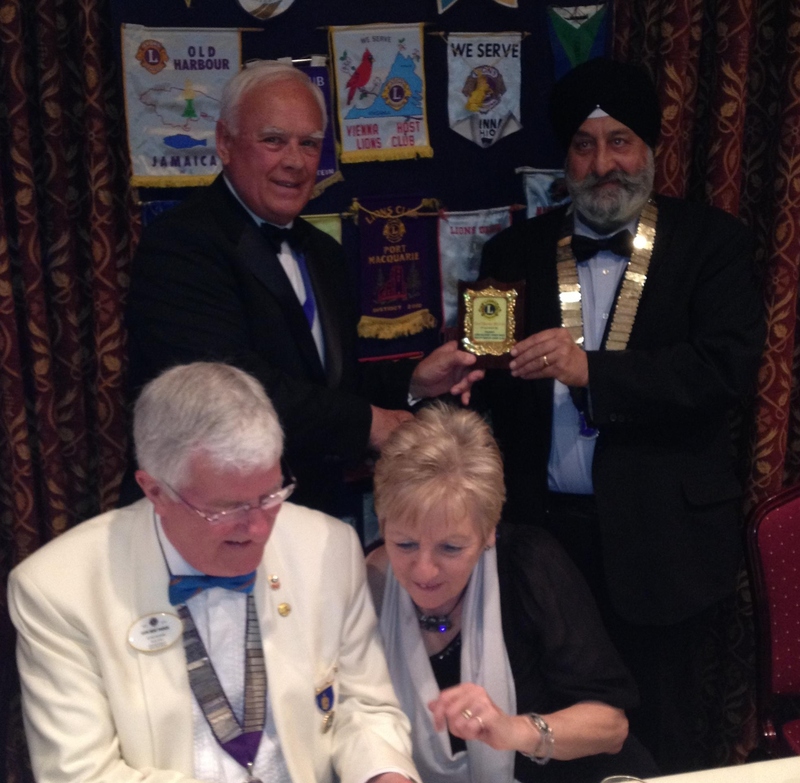 A new member, Mr Kashmir Rana, was inducted on 18th November 2014. 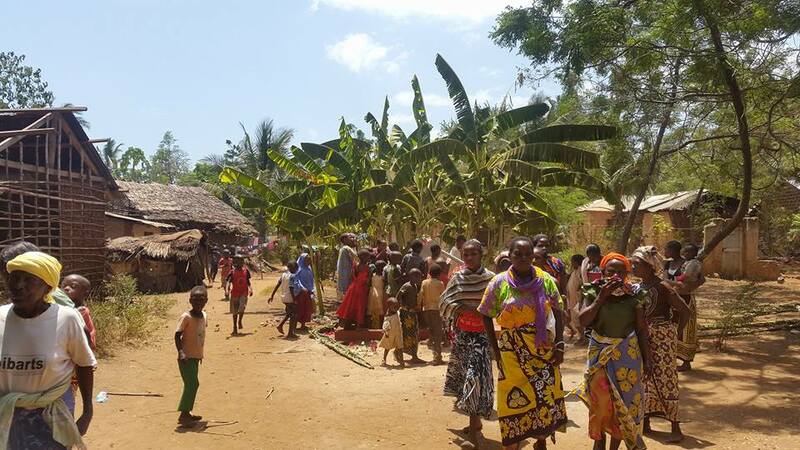 Borehole project in Mombasa, Kenya. 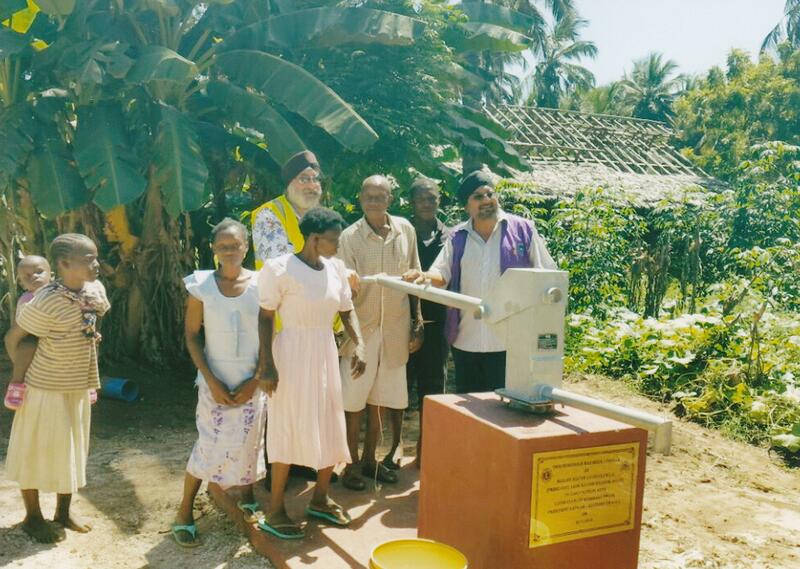 Two water boreholes were installed in small villages on the outskirts of Mombasa, Kenya, East Africa. The object of the project was to provide potable water to the school children and the locals in the villages who trek long way between 1.5km – 2.5km daily to water points for their water needs. It was reckoned that besides the general requirements of water usage some water may be diverted for irrigation purposes to grow crops for the locals. 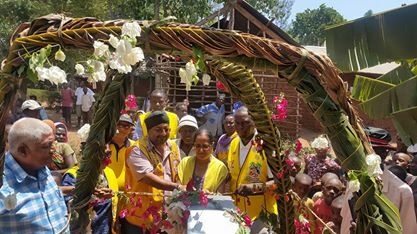 The project was planned on the basis that Bexley Sidcup Lions Club will bear the capital costs while construction and maintenance will be the responsibility of the local Lions club of Mombasa Pwani. 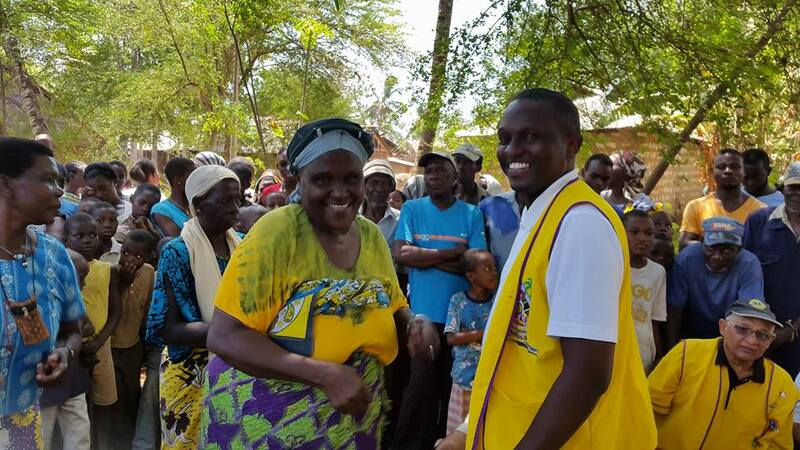 We thank President Lion Lata Magon and members of Pwani LC for their assistance and contribuition. Tenders were received from the local contractor who had previously carried the sinking of the boreholes in the area. The boreholes are sited in Tezo ward county of Kilifi north of Mombasa on the way to Malindi. The fund raising for the project commenced in 2012 on the conception of the project with the individuals donating monies varying from £1000.00 to £5, bucket collections at local super markets, collections made at religious institutions especially from the people affiliated with East Africa. By September 2013 funds stood around £3,727.00 with further pledges. 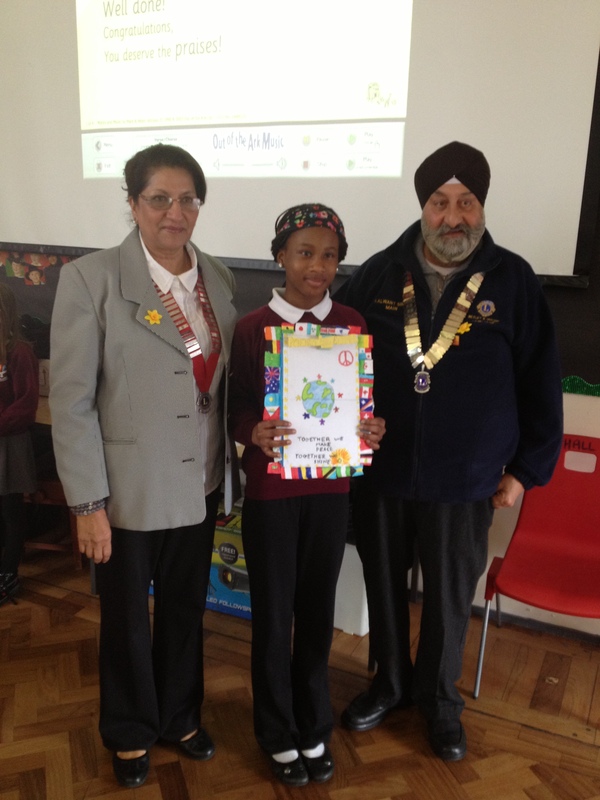 Lion Kalwant was commended for his efforts in raising £3,000 approx. single handed. 150mm diameter boreholes were sunk to a depth of 21-24m to reach sustainable water level with installation of steel casings and down pipes to draw water with hand pumps. Concrete aprons with edging were constructed for the base around the standpipe that provided a suitable area for water collection and also controlled the spillage. 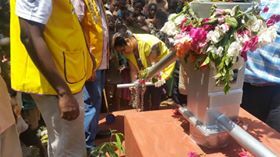 It is anticipated that approximately 2300 - 2500 people will benefit for their water needs daily from each location. Life expectancy of each borehole is generally very high depending on the replenishment of the ground water table and regular annual maintenance of the installation. 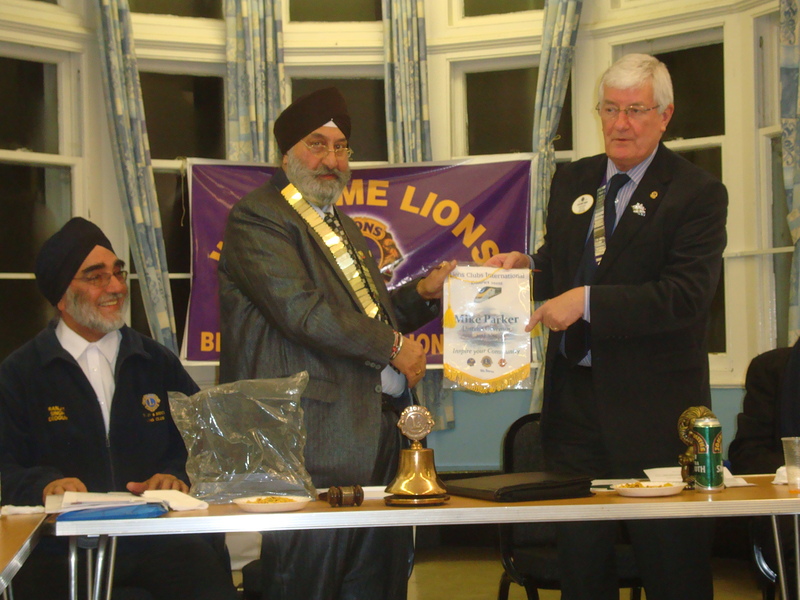 President Lion Gurdial Rai MBE inducted Dr Devendra Banker, sponsored by Lion Kulwant Selhi. Dr Banker has been assisting the members of the club at dibetic screenings and other activities for last few years and now he has decided to get involved in other projects. 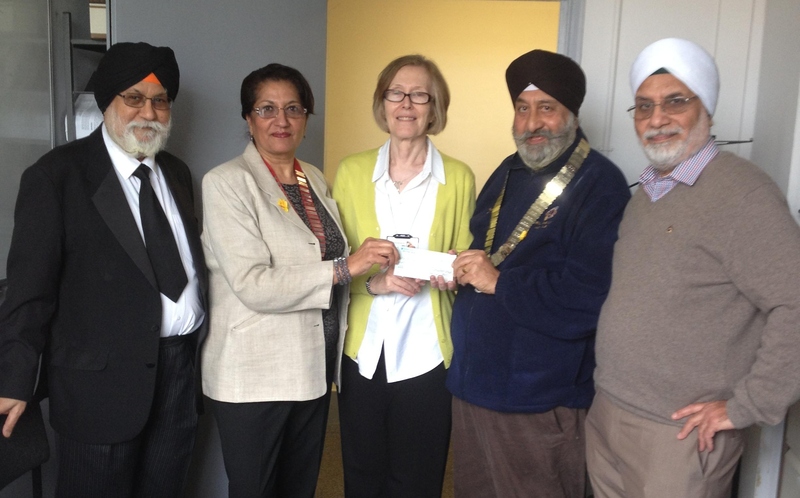 Bexley & Sidcup Lions Club donated funds for the Medical Camp in Moranwali village in District Hushiarpur in India. The project was initiated by the president Lion Gurdial Rai MBE with the partnership of Har Sewa Medical Trust in the village. The local publicity team informed the village population of this camp to be held on 27th September 2014. The local dispensary offered their premises for the day. there were doctprs, opticians, nurse and their assistants, who volunteered their services for the project. 1,380 patients turned up on that day. There were various clinics held on that dya such as: optical, orthopaedic, surgiacl, cardiology, gynaecology and ENT. Patients requiring hospital treatment were referred to appropriate hospitals and the Trust provided funds for those who were unable to pay for their treatment. 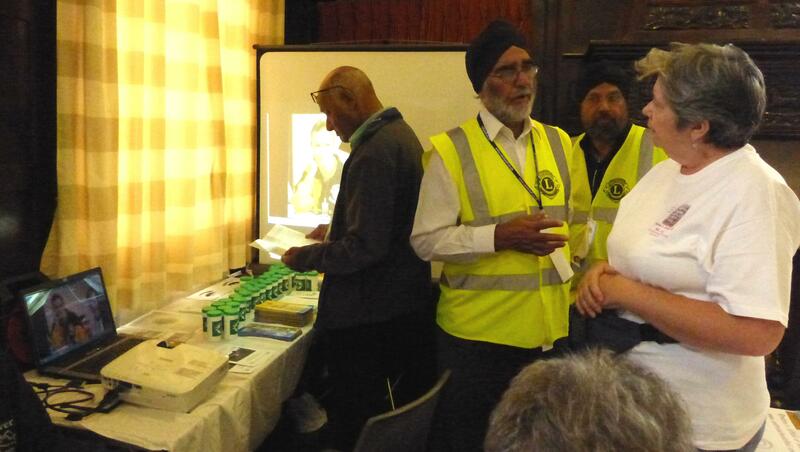 Bexley and Sidcup Lions Club participate in RECYCLING used spectacles.Lions club of Chichester receive all used glasses collected by all the clubs in British Isles and Ireland. They are sorted and distribuited to clinics and eye camps in communities across Africa, India and Eastern Europe in partnership with Maxico France. Some people who come along , consider themsleves blind until they are checked and given the correct glasses and a new lease of life with SIGHT. The management of the Centre had arranged an open day for regular users of the Centre in order to promote further usage of the place by public. The participants had the displays of the particular interests in the various rooms of the centre plus small marquees were set in the grounds for outdoor activities. 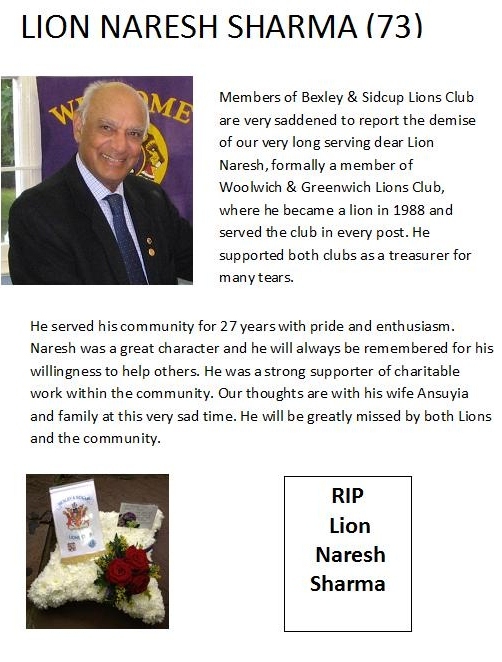 Bexley & Sidcup Lions Club was represented by Lions Ranjit Deogun, Gurdial Bharj, Karamjit Matharu, Naresh Sharma and Kalwant MainThe promotional material was projected electronically on a screen while the leaflets were displayed on the table. Main item of interest was the “Message in the Bottle” A good number of the card board holders were given to the elderly people who showed a great interest in the simple idea of letting the Ambulance team, Paramedics and any other party who may be called to attend the needs of the helpless person living alone in the house. The scheme receives a full support of NHS, Police and other community aiders who are faced with the emergencies during the call outs. Lion Ranjit did an excellent job in explaining workings of the scheme to the interested people. 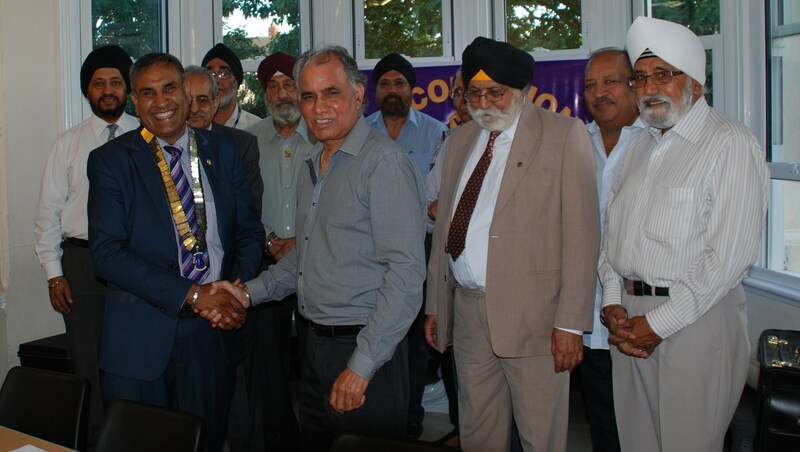 Lion Kalwant Main handed over the president's chain to Lion Gurdial Rai MBE. 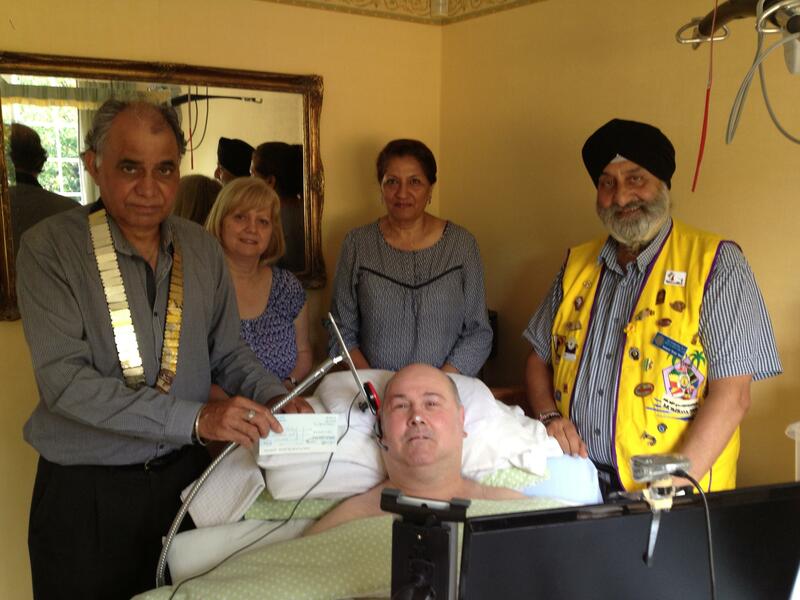 Presented a cheque for £250 to a local lad in Sidcup for his fund to buy a samrt phone called HOUSEMATE. Andrew Selby is Tetraplegic since his accident in 2004. 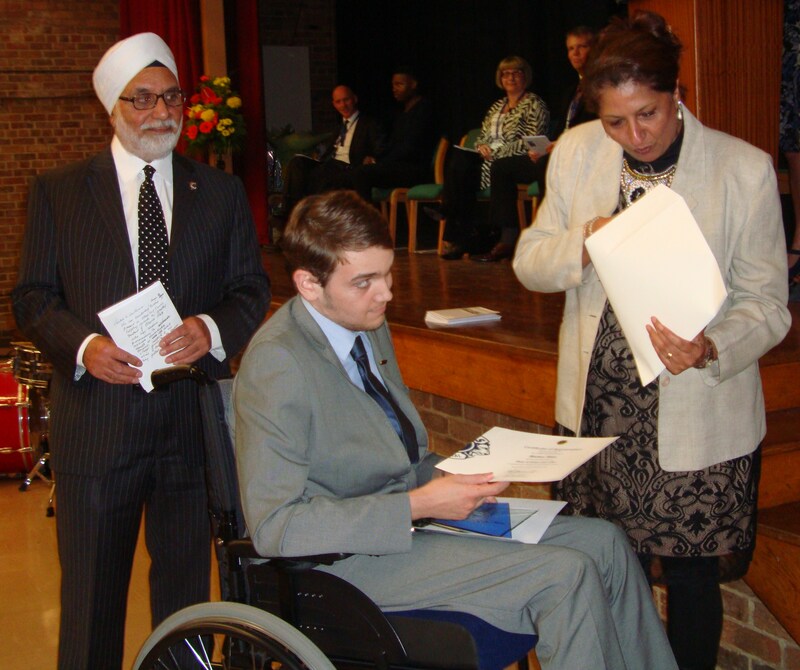 He had a spinal cord injury that left him paralysed neck down. He needs assistance in all activities of daily life. This will help him communicate with rest of the world almost independently. With this smart phone he'll be able to control his room lights, curtains, bed adjustments, room temperature, TV channels and DVD player, make phone calls and send texts, browse the internet and have the nurse call on it. This is great innovative technology for people with special needs. Handing out the cheque are President Lion Kalwant Main and Zone Chairman Lion Kaldip Deogun to Andrew Selby and his wife Jan. Golf Club. A very enjoyable night. 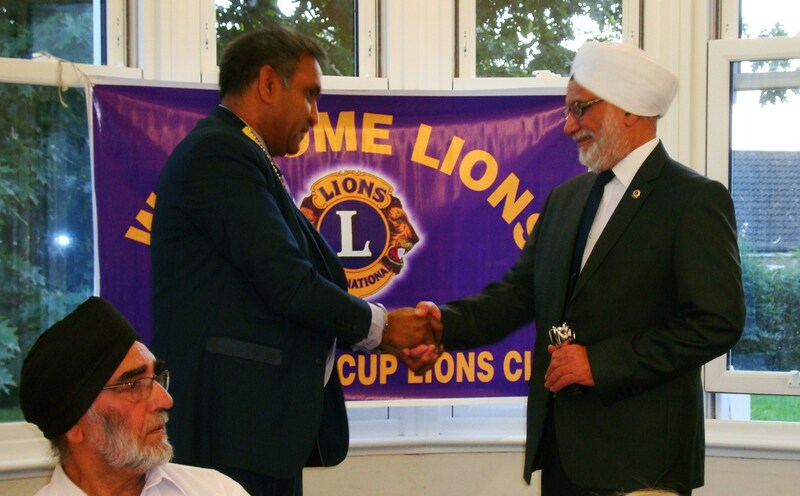 Zone Chairman Lion Kaldip Deogun receiving the momento from President Lion Kalwant Main. 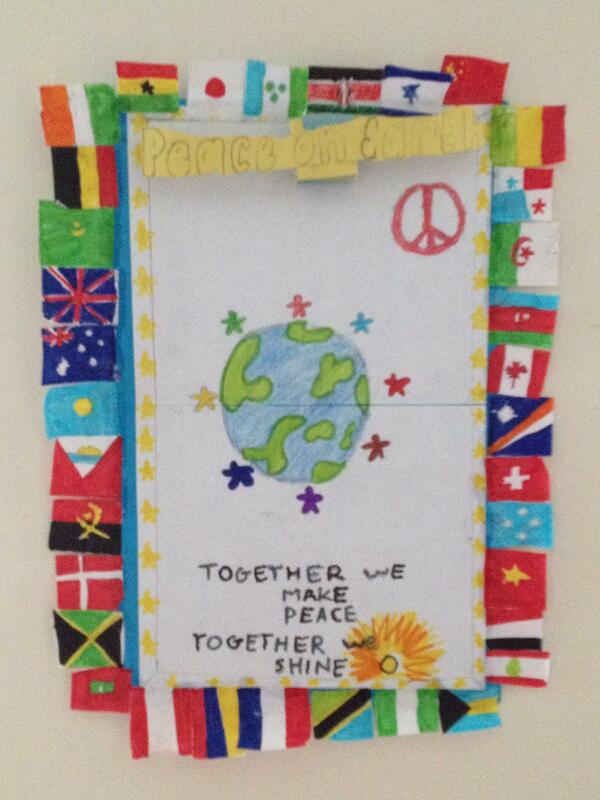 Poster for Peace Competition was held in East Wickham Primary Academy in Welling. Students aged 8,9 & 10 participated. This was to encourage students to express their understanding through art. 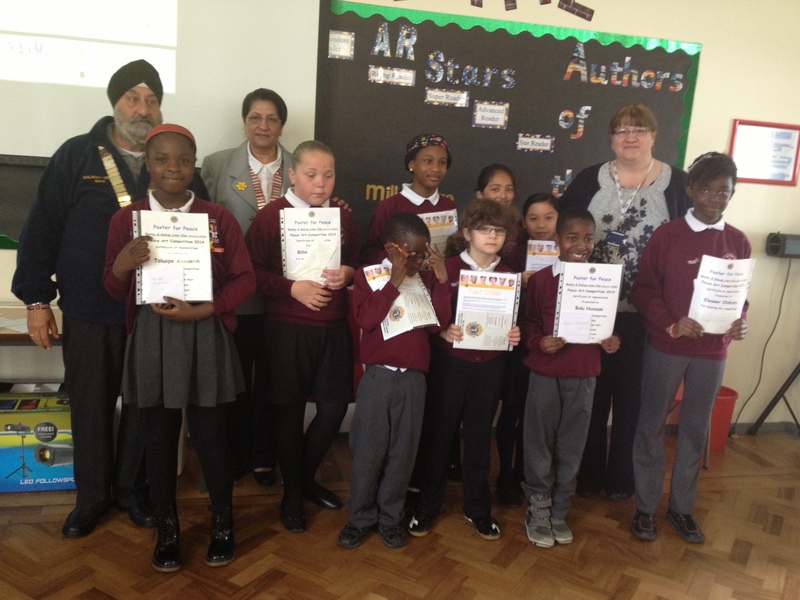 All the participants with President, Zone Chairman and the Head Teacher. of the kitchen at Bevedere Pop-in-Parlour. 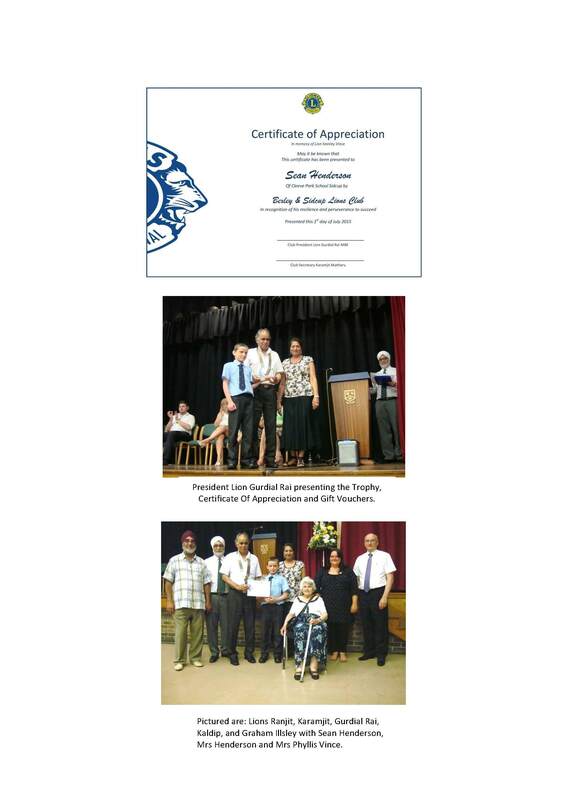 Pictured from left to right are Lion Kulwant Selhi, Zone Chairman Lion Kaldip Deogun, Manager Christine Hart, President Lion Kalwant Main and Lion Karamjit Matharu. 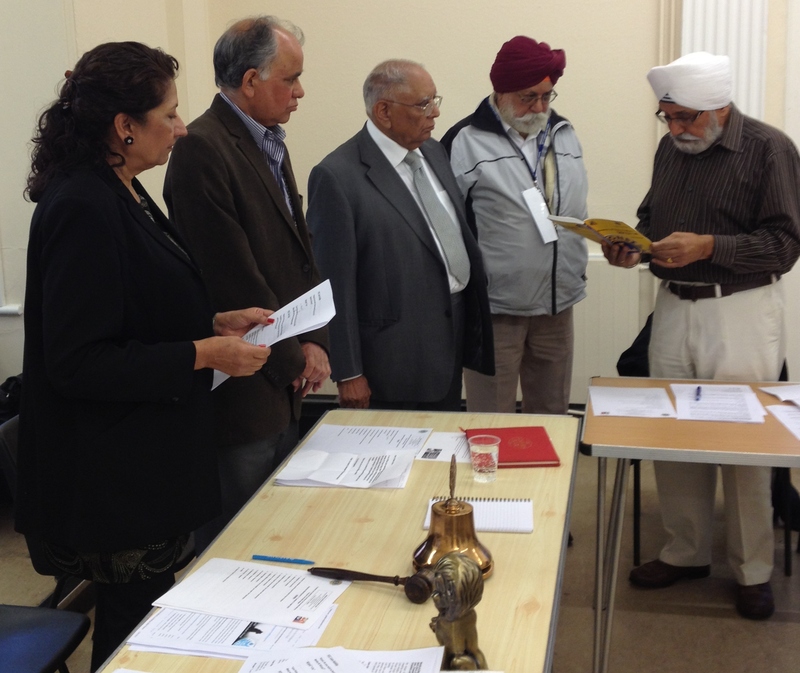 18th February 2014 Induction of a new member. 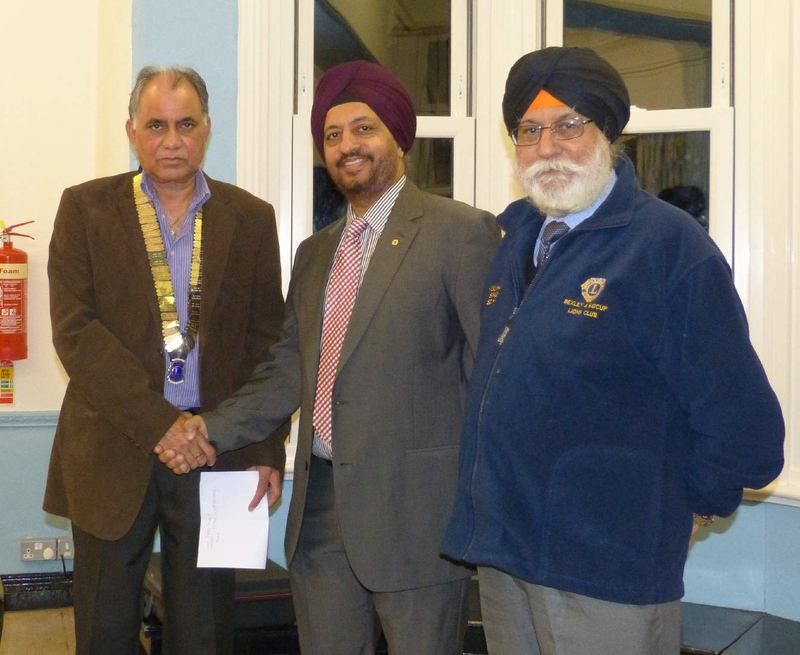 Pritam Dhanjal was inducted by the President Lion Kalwant Main, Zone Chairman Lion Kaldip Deogun and District Governor Lion Mike Parker. Pritam is a hardworking individual and keen to give his spare time to help the needy. We exetend our welcome to Pritam Dhanjal. 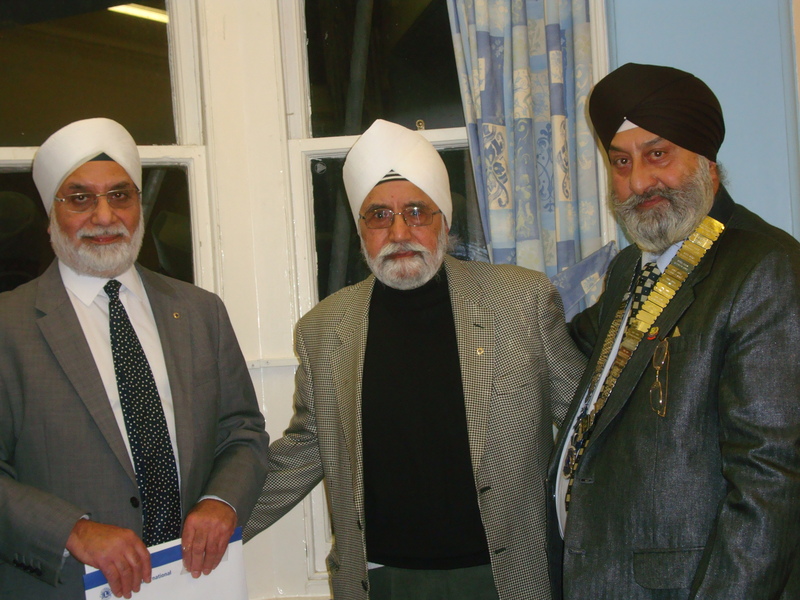 From the left are the sponsor Lion Karamjit Matharu, Pritam Dhanjal and President Lion Kalwant Main. 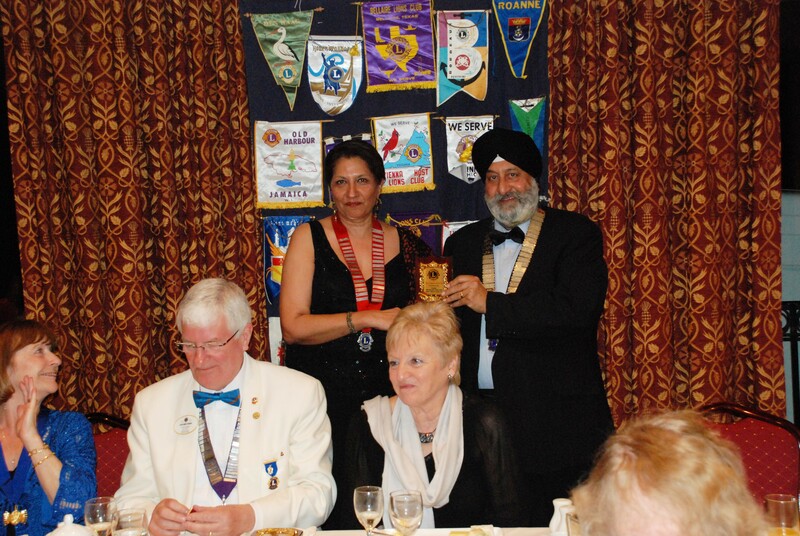 On the same night DG Lion Mike Parker presented his banner to the Club president. 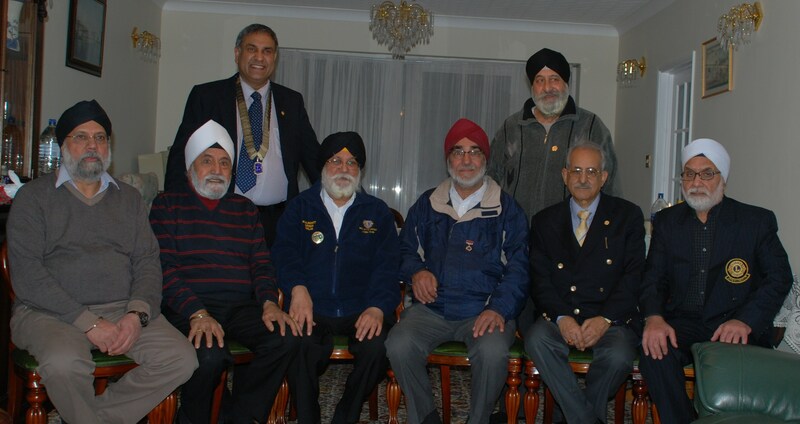 Pictured from left are Club Treasurer Lion Ranjit Deogun, President Lion Kalwant Main and DG Lion Mike Parker.